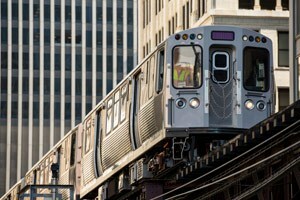 The Federal Transit Administration has estimated that there is a Chicago Transit Authority (CTA) bus accident on an average every single day in Chicago. Pedestrians, bicyclists, bus passengers and those driving cars and trucks are all in danger of accidents in Chicago. Although Metra accidents are less common, upwards of a dozen or more people per year on an average are killed in Metra accidents. We represent clients of all ages and their families throughout Illinois, and visitors from out of state who have been injured in CTA and Metra accidents. We also handle wrongful death claims arising out of Chicago bus and train accidents. If you have been seriously injured or lost a loved one in a train or bus accident, our lawyers can help. Contact Goldberg Weisman Cairo by calling 1-312-464-1234 or contact us online. Litigation against the CTA and Metra can be extremely complicated. The accident reconstruction can be more difficult than in other personal injury and wrongful death cases. There are laws in place to protect public transportation agencies from litigation, sometimes creating significant roadblocks to success. It takes a law firm with experience and significant resources to handle this type of litigation. Goldberg Weisman Cairo is the largest personal injury and workers compensation law firm in the entire state of Illinois. We have more than 30 years of experience representing clients in the Chicagoland area and throughout Illinois. In that time, we have won more than $2 billion for our clients in verdicts and settlements. We have the resources and experience to help you obtain the full compensation available to you under the law. If you have been hurt or if you have lost someone you love in an accident involving Metra or the Chicago Transit Authority, contact us online or call 1-312-464-1234. We offer free initial consultations.